As international travel grows in popularity, so does the number of vacationers who are opting-in to protect their investments by purchasing travel insurance. According to a recent AAA Travel survey, nearly 4 in 10 Americans (38 percent) are likely to purchase travel insurance for future international trips. For those travelers, trip cancellation protection is the most valuable benefit with 9 in 10 (88 percent) of those likely to purchase insurance saying that getting their money back, if they cancel a trip, is their top priority. AAA Travel’s national data also reflects an increase in demand for travel insurance and members choosing to protect their more expensive vacations. AAA’s domestic and international travel insurance sales have increased more than 20 percent year-to-date across the country, with 13 percent more members overall opting to purchase travel insurance last year compared to 2016. In 2017, AAA members insured trips that were approximately 18 percent more expensive than the previous year, according to AAA’s 30-year travel insurance partner Allianz Global Assistance. Sick happens. Insurance may help cover medical expenses while traveling, internationally and in the United States. Many hospitals outside of the country require cash payments before providing treatment. 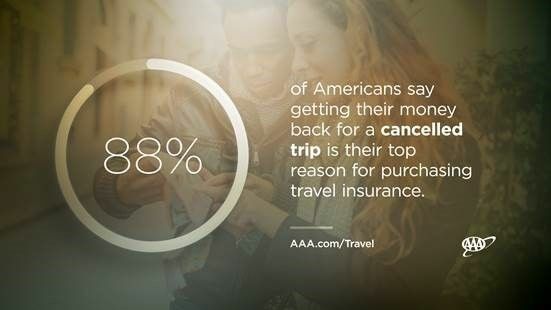 About the AAA Survey: AAA’s travel insurance research findings are the result of a telephone survey (landline and cell phone) consisting of 1,003 adults living in the continental United States. Interviewing for this survey was conducted June 21-24, 2018. This study has an average statistical error of ±4 percent at the 95 percent confidence level for all U.S. adults.